Saturday was a free day with “optional bike ride”. Of our gung-ho group, I was the only one who noticed the “optional” keyword. 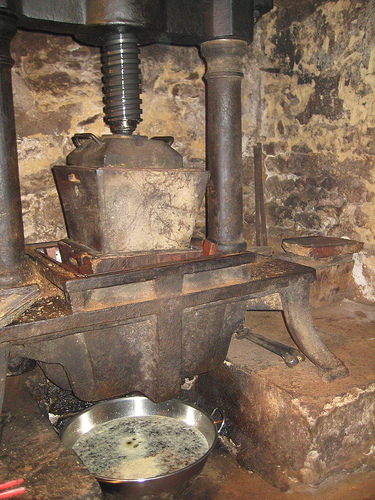 So everyone rode off and I got in the van and we drove to Moulin de la Tour, a 16th century walnut mill on the Enéa River. 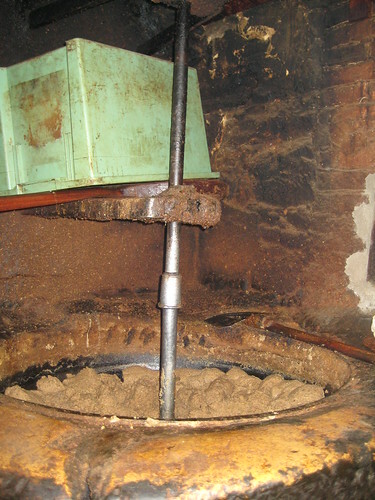 The mill is water powered, the grindstones are granite, the nut paste is heated in a cast iron cauldron over a wood fire, and pressed through canvas cloth to obtain the oil. One thing we noticed about the mill was how low the ceilings were. 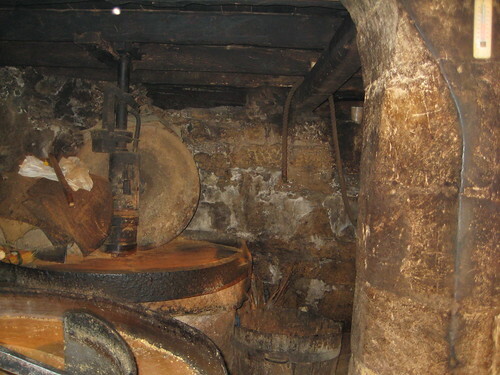 In addition, the drive system (pulleys and belts from the water wheel to the various mechanisms) was hung from the ceiling, reducing head room even more. Everyone who worked there seemed to be very short, but a taller inattentive visitor would be in danger of being scalped! We also stopped at the gardens of Eyrignac, an homage to the art of topiary (or, as our fellow rider Rebecca said, “Very organized bushes”). Only a very small portion of the gardens could be reached by wheelchair, and that involved pushing over crushed gravel paths, so despite the reduced entrance price, for me it wasn’t really worth the effort.